"Siri, where did I leave my AirPods?" Ding-dong! The 3.5mm headphone jack is dead — but, boy, did we get some sweet new AirPods in return. And listening to him talk, it’s hard not to think he’s got a point! Long-rumored by Apple watchers, the iPhone 7’s swanky new AirPod accessories represent the next step in Apple’s audio journey. 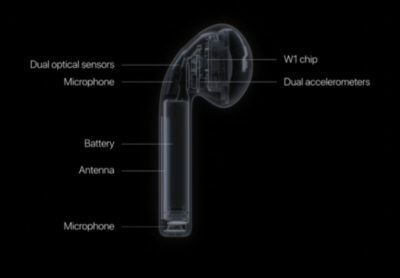 Apple’s not totally ditching its wired approach to headphones — the iPhone 7 will come packaged with Lightning EarPods, and even a 3.5mm jack adapter — but it’s clear that wireless is the vision the company is embracing. We’re already kind of nervous about losing them, though. The $159 AirPods boast some nifty new features, including dual optical sensors, built-in microphone, battery, microphone, dual accelerometers, as well as Apple’s first ever wireless W1 chip. For instance, infrared sensors detect when the AirPods are in your ear, so music or sound only starts when you’re ready for it. A double-tap, meanwhile, activates Siri, while the battery life gives you five hours on a single charge — or a charging case which adds up to 24 hours. In terms of design, the AirPods are understated, although the weird-looking stems may take a bit of getting used to. Don’t worry if they are, though, because Beats will also be releasing new headphones utilizing Apple’s W1 chip, including the Solo3 Wireless and PowerBeats3 Wireless headphones. Something tells us Jony Ive isn’t kidding when he describes this as the start of a “truly wireless” future Apple is working toward. Hey, at least in the case of the AirPods, we’ll only have to wait until they ship in late October! What did you think of Apple’s wireless AirPods? Leave your comments below.